USS Philadelphia was a sailing frigate of 38 guns built in the early days of the United States Navy, and notable for her loss in Tripoli (now Libya) during the Barbary War in 1803 and subsequent destruction to prevent her use by the enemy. Philadelphia, a 1240-ton frigate, was built at Philadelphia, Pennsylvania, as a contribution to the Navy by the citizens of that city during the 1798-1800 Quasi-war with France. Commissioned in April 1800, the ship conducted wartime operations in the West Indies for several months, capturing five enemy armed vessels and recapturing six American merchant ships that had previously been taken by the French. In June 1801 Philadelphia sailed across the Atlantic for service against Tripoli, which had been conducting warfare against U.S. commercial shipping in the Mediterranean area. After nearly a year overseas, the frigate returned to the U.S. in July 1802 and was laid up. Philadelphia was recommissioned in May 1803 under Captain William Bainbridge and again went to the Mediterranean Sea for operations against the North African Barbary states. In late August she retook an American merchantman from a Moroccan warship. Some weeks later, after the arrival of the larger frigate USS Constitution under Commodore Edward Preble, Philadelphia was sent eastwards to begin a blockade of Tripoli. 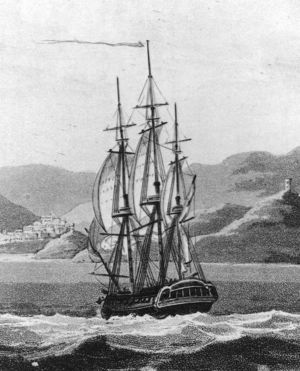 In October 1803 Philadelphia and schooner Vixen arrived off Tripoli. Under orders from Commodore Preble, they were to closely blockade the North African port in an effort to bring the hostilities to a satisfactory conclusion. Captain Bainbridge soon sent Vixen off to look for some enemy cruisers, while keeping his frigate nearer Tripoli to maintain the blockade. On 31 October Philadelphia sighted an enemy vessel running just off shore and pursued. Realizing that the water was becoming shallow, Bainbridge turned seaward and ran aground on an uncharted reef. The Tripolitans quickly sent a large force of gunboats to attack the stranded Philadelphia, which was listing so severely that her broadside guns could not fire on the enemy. Though the frigate's crew worked for hours to lighten their ship, throwing overboard guns, equipment and supplies, and ultimately cutting away her foremast, she remained stuck fast. Essentially defenseless, and with Tripolitan reinforcements approaching, Bainbridge surrendered his ship and crew. The capture of USS Philadelphia by the Tripolitans at the end of October 1803 seriously reduced the U.S. Navy's Mediterranean force and potentially increased the enemy's seagoing offensive power. Though it turned out that Tripoli lacked the resources needed to operate the captured frigate, this was by no means clear at the time, and Commodore Preble began planning to eliminate the problem. The idea of recapturing the Philadelphia in Tripoli's well-fortified harbor offered little chance of success, but her destruction appeared feasible, if heavy losses by the raiding party were accepted. There was no shortage of volunteers for this hazardous mission. Lieutenant Stephen Decatur, Commanding Officer of the schooner Enterprise, was appointed to lead the operation, which would be conducted using a recently captured local ketch that was appropriately renamed Intrepid. With a crew taken from Enterprise and the flagship Constitution, plus a Sicilian pilot who was familiar with Tripoli harbor, Decatur sailed from Syracuse on 3 February 1804. Storms kept Intrepid at sea for nearly two weeks, with her people enduring much from crowded circumstances, poor food and the generally filthy condition of their vessel. On 16 February Decatur approached Tripoli, keeping all but a few of his men below decks to maintain Intrepid's appearance as a local trading vessel. That night, navigating by moonlight, he sailed into the harbor and, claiming to have lost his anchors, requested permission to tie up alongside the Philadelphia. This was granted, but the disguise was discovered as the two came close and an alarm cry rang out. Decatur immediately ordered his men to board, which they did so swiftly that the frigate's guards had no time to organize resistance. Most jumped overboard and swam ashore, while the Americans rapidly prepared to burn their prize. Less than twenty minutes later the Philadelphia was blazing brightly. Casting off just ahead of the flames, the Intrepid's men rowed out of the now well-lighted harbor, pursued by gunfire. The operation was a complete success: Philadelphia burned to the waterline and sank, while none of the raiders were killed and only one injured. In the words of British Admiral Horatio Nelson, this was "the most bold and daring act of the age". Bainbridge was placed before a court of inquiry after his return to the United States; although acquitted of blame for the loss of his ship, he was once asked why he didn't blow her up to prevent her capture. His reply was tart and to the point: "I didn't think I had the liberty to put to death 306 souls merely because they were placed under my command." Less than ten years later in the War of 1812, Bainbridge would have his reputation restored while in command of USS Constitution in her victory against HMS Java. This page was last modified on 15 September 2016, at 11:39.